Pra Roop Muean Luang Por Tarb Guru Monk image in Nuea Pong Dam Pasom See Pheung Khiaw Pim (Hlang Riab). A very rare and popular amulet for Metta, Maha Lap, and Klaew Klaad Kong Grapan, from Luang Por Tarb, of Wat Grabok Kheun Pheung. This amulet isd also beloved by devotees of Luang Phu Tim (Wat Laharn Rai), who was present to join Luang Por Tarb for the empowerment ceremony. The front face of the amulet features the image of Luang Por Tarb, within the classic tapered arch we have all come to know as the classic 'Pim Tao Reed' clothes-press shaped amulet which has come to be synonimous with Luang Por Tuad. 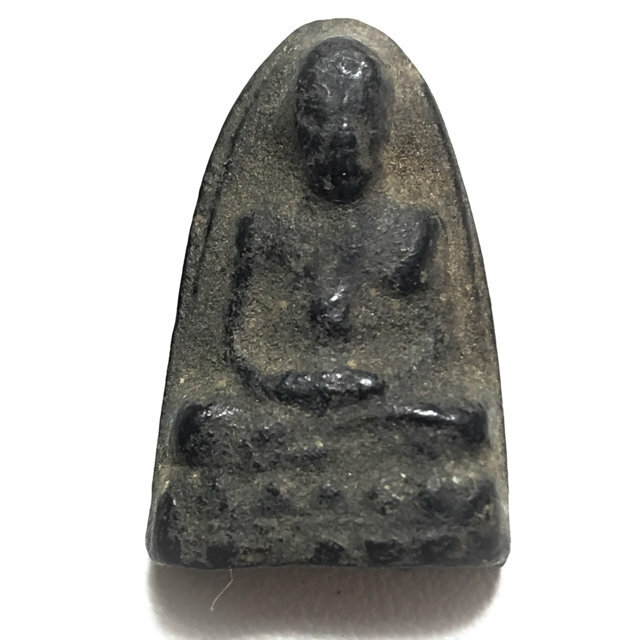 This series featured Luang Por Tuad Tao reed amulets, and so the Roop Muean images of Luang Por Tarb were made using the same shape and style as the Luang Por Tuad models, to remain in style with the edition. There were various sizes of Roop Muean and LP Tuad models, all of which are now very rare, and immensely sought after acquisitions. Although it is still sometimes possible to find the odd amulet of Luang Por Tarb, it is becoming ever rarer these days to see one in circulation in the Public Amulet Exchanges, and one can definitely say that his amulets are amongst the rarer ones to see in the present day. This series has always enjoyed extreme popularity, as the Pra Pong Pasom See Pheung Khiaw series amulets of Luang Por Tarb, are considered very powerful Metta, Maha Lap, Klaew Klaad and Kong Grapan Chadtri magic.